If you love the look of bold colors, rustic furnishings and Native American influences, then you might want to consider Mexican interior design for your home. Mexican design has an eclectic feel, mixing rustic wood and wrought iron furnishings with over-the-top, bright, vivid colors. The look incorporates elements from the Spanish missionaries and conquistadors who came to colonize this area of the Americas with elements from the native tribes living in what is now Mexico, including the Aztecs and the Mayans. This blending of Spanish European architecture and native tribal culture led to some of the most beautiful and colorful art and décor found anywhere in the world. Rich colors and woven textures are key when it comes to decorating a Mexican style room. If you have accent pieces, like pottery or ornate furniture, that you'd like to show off, keep the background of the room simple. Paint your walls a warm color that will serve as a backdrop for your Mexican inspired room. For a bold look, choose an interior paint in a rich earth tone like brick or clay. If the dark walls are too much for you, opt for a warm neutral like sand or taupe. 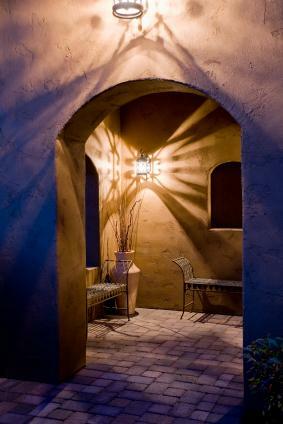 For a look of authenticity, use a faux paint technique to create the look of stucco or adobe. Use rich colors like deep blues, golden yellows, vivid reds and lush greens as accents through your room. When it comes to choosing decorator fabrics, look for woven textures in primitive prints and patterns. Spanish colonial furniture is the most formal and elegant style of Mexican furniture. Tuscan furniture has an Old World, Mediterranean feel, while Santa Fe and Texas Ranch have rustic influences from the old West. Mexican furniture can be finished with a light, distressed look of natural or weathered wood or can be stained in dark, rich copper tones. One of the most sought-after Mexican-style accessory for the home today is Talavera pottery. Authentic Talavera pottery is made in the city of Puebla and a few nearby communities in Mexico. This area contains the high-quality clay from which Talavera pottery is made. The pottery was originally brought to Mexico by Spanish settlers. Talavera pottery has intricate and colorful designs, many of which are influenced by the culture, flora and fauna of Mexico. The types of Talavera pottery you can find for the home include tiles, dishware, platters and trays, serving pieces, wall art and other decorative accents. Mata Ortiz pottery is also a highly sought after form of Mexican ceramics. This type of pottery originated from the small town of Mata Ortiz in northern Mexico. The pottery is made from clay found in the Casas Grandes region of Mexico. The design and style of this pottery was the creation of master potter Juan Quezada. Decorative ceramic tiles are classic Mexican home accents that can be used for a kitchen backsplash, for table or counter tops or as a colorful decorative frame around a mirror. 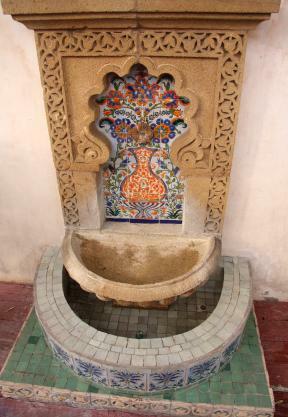 Talavera tiles are commonly used for decorative fireplace or wall murals, to embellish sinks, as borders for mirrors, windows or doorways, on fountains and in bathrooms. 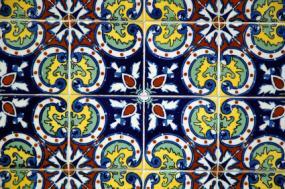 Terra-cotta tiled floors are commonly seen in Mexican style design. Interior courtyards are another common element of Mexican interior design. Large arched doorways, scrolling iron accents and painted stucco walls in warm earth tones are mixed with dazzling bright accents in shades of red, yellow, orange, green and blue. Rustic wood, wrought iron, ceramic and copper furnishings and décor can be found both inside and outside of a traditional Mexican style home. Visit Mexconnect to view a gallery of Mexican interior design photos and articles by Austin, Texas based interior designers, Karen Witynski and Joe P. Carr. Add splashes of color and interest throughout your room with traditional Mexican folk art, pottery or tapestries. Talavera pottery is a Mexican style of ceramic that usually hand painted with colorful motifs or intricate mosaic patterns. A Talavera vase, urn or platter set on a stand will look beautiful on a shelf or side table. This type of ceramic is also used to make tiles, flower pots and candle holders. Traditional Mexican folk art includes wooden carvings, statues, religious art and other hand crafted ornaments. In Mexican home decor, you may see some Day of the Dead (Dia De Los Muertos) folk art. These items include elaborately decorated skulls and skeletons. Wall hangings made of metal like tin or copper. Mexican art prints and paintings by artists like Diego Rivera. 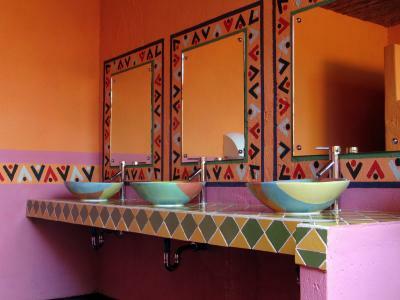 Southwestern design is heavily influenced by Mexican art and culture. Interior design styles found in Texas, New Mexico, Arizona, Nevada and California all have flavors of Mexican culture mixed with elements native to each of these different areas. However, influences from Mexico have reached far beyond the southwestern United States. The warm and exotic look of Mexican interior design can be found anywhere someone has a passion for it.